Ken Farmer knows both Virginia and Southern material culture. He and his wife, Jane, live in Keswick, Va., and are fixtures at the PBS television series Antiques Roadshow where Jane works the aptly named “triage” table and Ken works at different tables, including folk art, furniture, musical instruments and sometimes decorative arts — and where Ken dispenses on-air appraisals. 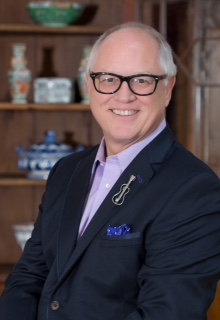 With 40 years in the trade, he recently announced that he was exiting from the auction business — namely, Quinn & Farmer Auctions, which was formed in October 2012 when he joined forces with Paul Quinn to purchase the former Harlowe-Powell Auction Gallery in Charlottesville, Va. The pair formed Quinn & Farmer Auctions, where Ken served as president and Paul executive vice president and manager. What’s behind your decision to leave the auction business and focus on appraisal services? It’s something I’ve been considering for the past year and a half, particularly since the partnership I’m in with Paul was set to run for three years. It would run out at the end of September, so it seemed like the perfect time. I felt like I wanted to work with people who have need of my services, whereas Paul really likes the auction business. For me, now’s the time to do it. When I work as an appraiser I can give a third-party opinion, but as long as I was an owner, I had a duty to the business. I’ve always bought and sold, so I’ll just be doing more of that. Where do you see the live auction business going? I think the biggest challenge in the live auction world is how to find a younger crowd to buy the average quality things. In order be successful you need to be very much in tune with Twenty-First Century technology, so there’s a need to make information easily accessible by people who are under 40. When you go to an auction and see people sitting there with gray hair, that should tell you something. With the business model of online-only sales, which addresses the problem that brick-and-mortar houses have with the cost of labor, moving and storage, making the numbers work is a lot easier if you’re having $10–30 million worth of sales a year. But if you’re at $1–3 million a year and you’ve got a lot of overhead, then it’s a lot more difficult. For the top five percent of items crossing the block, however, the live auction model is still viable. The main thing is that if it’s important, it needs to be available so somebody can see it in person. And probably the days where someone would sit through five hours of an auction are numbered. We understand that you’re a musician as well. What kinds of musical adventures are calling you? I play blues and other acoustic styles and play out at least once a month at local breweries and bars, as well as doing some concerts. Charlottesville, in fact, is a great place for live music. I play solo and with other musicians, usually a drummer, bass and another guitar. The folkier material I usually play with my oldest son, Will, who lives in Salem, Va., and is also a guitar player and singer, as well as being the owner of Farmer’s Auctions. “The Misses Stewart Hodgson,” circa 1880, oil on canvas. I don’t exactly know [chuckles]. A bunch, more than ten. Lately I’ve been playing a slotted-head Taylor for fingerpicking, but my favorites are a 1938 Martin D-18 whose sound is just amazing and a 1958 Gibson ES-250 for electric style. My most recent guitar is a Goldtone dobro made by a guy in Maryland; it has a round neck so I set up it up to play slide like a regular guitar. Any interesting anecdotes from your Antiques Roadshow appearances? One of the funniest things happened during my first or second season working in decorative arts, where a lady brought in a fitted mahogany case, describing it as a “vampire killing kit.” I had never seen one, so I went around to the various tables asking for opinions. She followed me around and ended up cussing a blue streak when one of the manuscript guys pointed out that the label on the box was laser-printed. We ended up not filming that segment. What’s the most expensive or most interesting antique that you’ve been able to find a new home for? 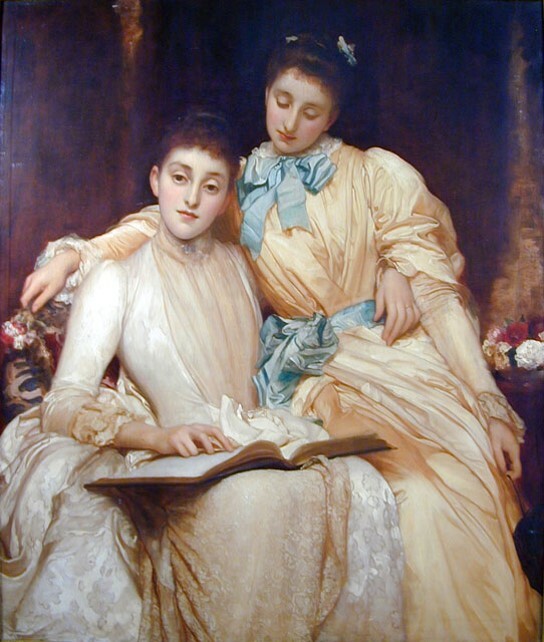 Probably an English portrait by Frederic Leighton that sold for $550,000. It was of two young women and interestingly sold online through Sotheby’s back in the early 2000s. It was a record price at the time for something sold over the Internet.